Venetian Renaissance Colour Painting Method: Compare "Disegno". In Italian Renaissance art, the term "colorito" means "colouring", and is commonly used to describe the priority accorded by Venice artists to the mastery of colour pigments and tones, in painting. The main alternative to colorito was "disegno", which favoured the art of drawing over colourism, because the former was deemed to be inseparable from the intellectual conception of the painting itself, and thus superior to the mere mastery of colour paint. This debate, which raged throughout the years of the Early Renaissance (c.1400-90) and the High Renaissance (c.1490-1530) was a very serious dispute over aesthetics, and was argued over by many of the leading exponents of academic art, up until the 19th century. The question as to which was more important in art, drawing (disegno) or colour (colorito), was answered differently according to whether you lived in Florence or Venice. The fact was, painters from different areas of Italy approached the depiction of nature quite differently and, as a result, created works of art that differ not only in technique and appearance but in their very conception. During the Renaissance in Florence, a city sandwiched between Siena and the Papal States, artists looked for inspiration to the humanism and order of Classical Antiquity. For these Florentine painters "drawing" or "design," was seen as the key starting point of artistic endeavour, the primary means for portraying nature as realistically as possible. However, artists of the Renaissance in Venice had a completely different view. Their powerful northern Italian Republic, with its worldwide maritime trading links and overland trade routes, had close associations with Byzantine art, famous for its shimmering gold icons and mosaic art, and its inattention to figurative realism. Not surprisingly therefore, Venetian art favoured a more colouristic approach, bolstered no doubt by its trade in colour pigments, such as Ultramarine (Lapis Lazuli), Chinese Red, Indian "Lac", Verdigris and Indigo. (See also: Renaissance Colour Palette.) This Venetian colourism was further stimulated by the city's damp climate, which was less suited to fresco and tempera paints, and more suited to oil painting - a medium which thrived on sophisticated colour and tone. See also: Legacy of Venetian Painting on European art. For optimum naturalism, Venetian painters placed a particularly high value on the correct application of colour, without which they believed no artist could properly capture the real effects of light and thus the true appearance of the object. The Venetian School of painting therefore paid great attention to the process of layering and blending colours to achieve a glowing richness. For an artform and period which illustrates the difference between disegno and colorito, see: Venetian altarpieces (c.1500-1600). 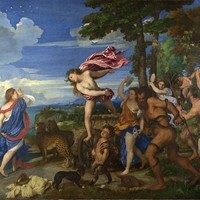 See also or short review: Titian and Venetian Colour Painting (c.1500-76). To the artists of the Florentine Renaissance a picture was composed of shape plus colour; to a Venetian it was shape fused with colour. To the Florentine, colour, however harmonious, was a quality to be added to design. To the Venetian it was inseparable from design. See Venetian painting. See also our fine art essay: How To Appreciate Paintings. In contrast, painters in Venice regarded the end-product as paramount, and in their eyes the achievement of this goal necessitated the extremely subtle use of colour. So, instead of starting with meticulous drawings, Venetian painters typically worked out their compositions directly on the canvas, preferring (in a strange anticipation of 19th century Impressionism) to use layered patches of coloured brushstrokes rather than line to define form. Even Venetian sketches show a keen interest in how light will affect an object and how colour will describe it in a painting. To encapsulate the Venetian belief in the superiority of colour (colorito) over line (disegno), one can say that the Venetian School considered a perfectly executed drawing to be no more than preparation for the key task of determining and applying the correct colour. If Michelangelo was feted in Florence as the champion of disegno and intellectual art, Titian was seen in Venice as the apostle of colorito and naturalism, followed closely by other Venetian masters such as Giovanni Bellini (1430-1516), Giorgione (1477-1510), Tintoretto (1518-94), and Paolo Veronese (1528-88).  For related terms, see: Colour Art Glossary.